Imagine being alone, every day of your life, without a family, home, food, or water. Imagine the frost bite trickling to every part of your body until it reaches your heart, and you feel yourself dying on those cold winter nights. Imagine the summer heat, beating on your skin and eventually robbing you of all of your body water, and you have no way of getting to fresh, crisp air or an icy water bottle. 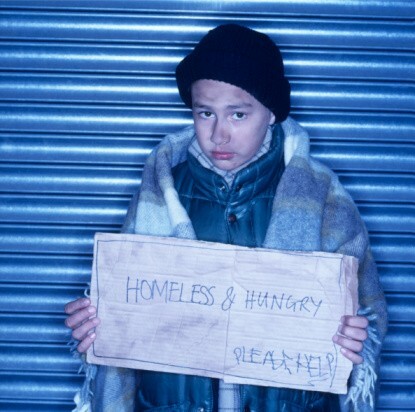 Imagine spending 24 hours of your day, 7 days a week begging for a blanket, or food. Imagine your stomach feeling so empty that soon enough, your ribs rip through your skin and you bleed to death. While imagining these horrors, would you say it's a dream? No- it's your worst nightmare. 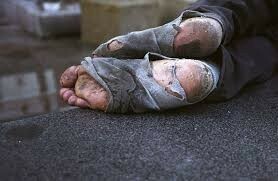 We see starving, dying people on the streets every day, and most of us don’t do anything about it. We think it is “normal". Sometimes, we just ignore the desperate looks on their faces, and walk away. 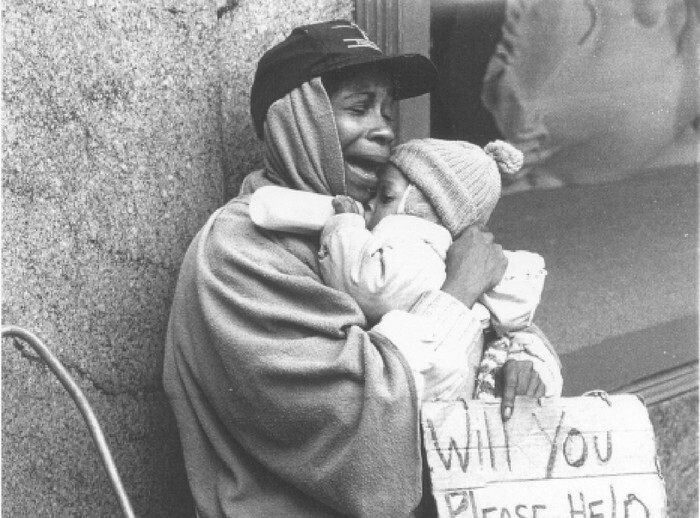 Some of us pass by and when they beg and beg for us to have some mercy and feed their hungry bodies, we say we don’t have anything to give. We lie to the broken ones, because, next thing you know, we are off to our favorite store, buying new clothes that we don’t need. After weeks, months, and maybe years of begging, they’ll eventually give up. Whether they commit suicide, or die of starvation, we are the cause of most criminals. 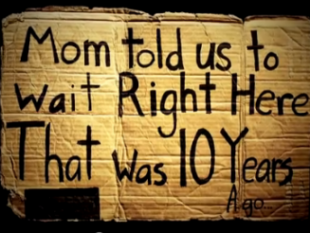 We don’t take care of the homeless; therefore, they feel as though they have no choice. They go out and steal their clothes from stores, or rob people of their belongings. They sneak into restaurants and consume other people’s food, or take some of their own without anyone noticing. When they're caught, they’re the bad guys, and they're the reason this world is coming to a horrible dream no one can escape.… the truth is, we are the cause. In this picture, a woman is clutching onto her baby for her life, and crying out for help. She needs warmth, comfort, and love. Her sign says "Will you Please Help"
Two children around the age of 15 and 13 were left outside of a corner store at the ages of 5 and 3 on a bench, in the rain by their mother. 10 years later, they still have nowhere to go. All they have is eachother. "Mom told us to wait Right Here. That was 10 years ago." Man's Best Friend, or Man's only Friend? This man only has his dog left. He has no family, food, or warmth. He only has dirty, old rags. 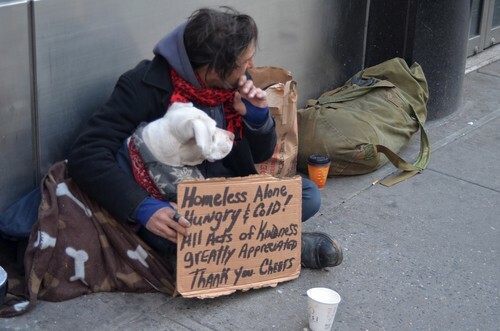 His signs says "Homelss, Alone, Hungry, and Cold! All Acts of Kindness, greatly appreciated. Thank you, Cheers"